News, rumours, analysis and assorted ramblings on the strategies, the missions, the procurement of kit and the future of the Armed Forces. Well, it'll be HMS only on 1 June, when she'll be formally handed to the Royal Navy, with commission expected for 23 June. But she'll enter Portsmouth for the first time at around 1.10pm on Monday. 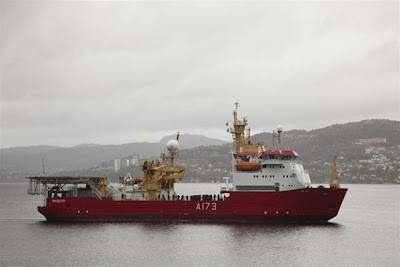 HMS Protector is the Interim Arctic Patrol Vessel, pennant number A-173. She born as the icebreaker/Polar research ship MV Polarbjørn (Polar Bear) in Norwey, and she's been chosen by the MOD to temporarily replace HMS Endurance for over three years. At the end of the loan period, a decision will have been taken: either repair Endurance (out of action since a flooding incident off Chile almost sank her nearly three years ago) or permanently acquire Protector to replace her. It'll be a purely economic decision, spurred by the fact that estimates put the repair bill for the Red Plum at 32 million. To become HMS Protector, Polarbjørn has undergone a quick ten-day refit in Odense, Denmark, where her flight deck was moved from the bridge roof to the stern and a multi-beam echo sounder survey system was fitted and Royal Navy insignia added. Her 88-strong ship’s company, led by CO Capt Peter Sparkes, will spend the summer and early autumn gearing up for her inaugural deployment to the southern polar region in November. Initially Protector will receive a small motor launch crammed with hi-tech survey kit and two Pacific 22 RIBs; the latter will be replaced on her second Antarctic deployment by a landing craft LCVP MK5 to move personnel and equipment from ship to shore. The new ship will also carry three all-terrain vehicles (Vikings of the Royal Marines, i'm guessing) and three quad bikes plus trailers to help the ship’s company re-supply British Antarctic Survey scientists in their far-flung outposts. Monday will also see the last return at home of HMS Gloucester, though. She'll arrive flying her decommissioning pennant roughly three hours before Protector. With 29 years of sterling service and nearly 800.000 miles on her odometer, the Fighting G will retire with honor, after her last six-months deployment around the Falklands/South Atlantic/South Americas, finished earlier this spring. In the last week, she has worked with a substantial US-RN-Franco-Spanish task force in the Western Approaches, headed by the USS George H W Bush, the US Navy’s newest supercarrier, on Exercise Saxon Warrior. Everybody can comment on this blog without needing a Blogger account. It is meant to keep the discussion free and open to everyone. Unfortunately, anonymous accounts keep the door open for spammers and trolls, so i'm forced to moderate comments and approve them before they appear. Apologies for the inconvenience. Gabriele Molinelli, journalist and blogger. Developed a huge passion for everything military at a very young age, due to Spitfires, Lancasters and Mosquitos. Myopia frustrated my chances to pursue a career in the military, so journalism felt like the best way to stay close to the military and talk of it. Pymes75 - follow the CVF building! Did he really want to hole aid ships...? Building on strengths: what happens to the amphibious force? Created and maintained by Gabriele Molinell - contact: me at molinelligabriele@gmail.com. Simple theme. Powered by Blogger.